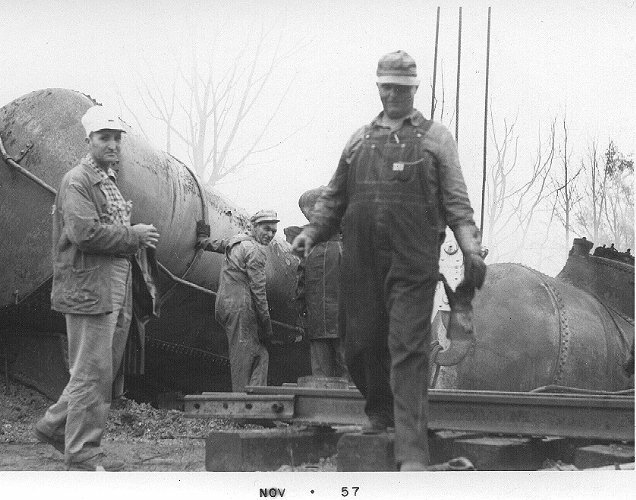 This is a derailment in either September 1954 or 1955. This was an empty troop train returning from K.C. that rocked off the rails coming down Rich Mtn. All Photos copyright C.D. Booth 1944 - present, unless otherwise noted on the particular page. All commercial rights reserved but individuals do have permission to make & possess copies for their own enjoyment and also for personal or commercial model making efforts, but do not have the rights to distribute these photos to anyone else as whole or part of any collections or otherwise. Elm Grove, LA Between Jan 1957 & mid 1960 F3A #50, F7b ? F3A ? March 31, 1966 Shreveport, LA Off Hollywood Av. In the albums on these pages, all photos will be preceeded by a number that corresponds to a list below it to view the full sized photo. Most are saved at X pixels x 500 pixels. Due to the file sizes many of these pages may load slowly.